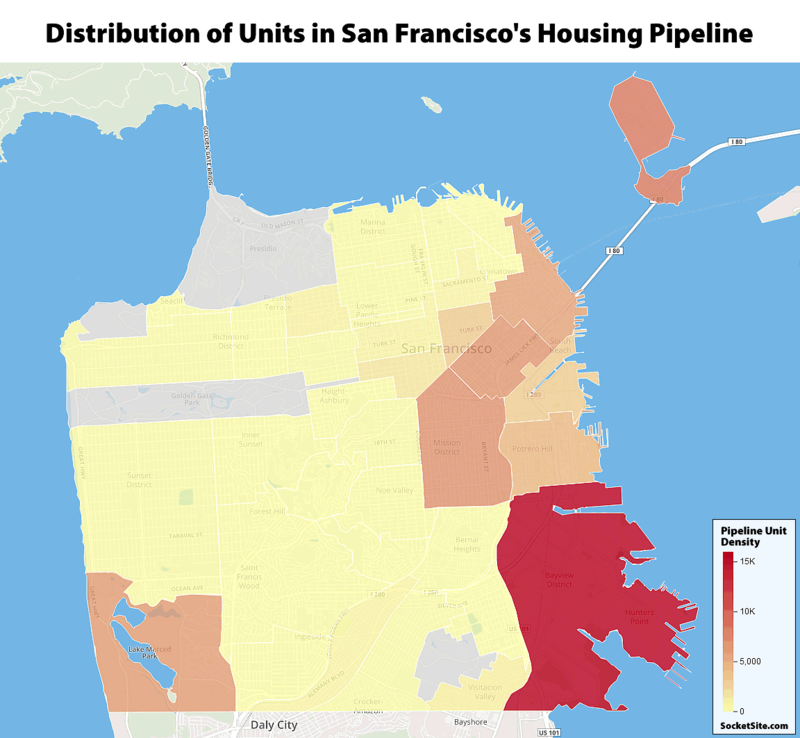 With the number of new units of housing in San Francisco that finished up construction in the third quarter of the year having outpaced the total of those which were newly proposed, the overall pipeline of apartments and condos under development in the city slipped by roughly 200 to 63,300. And for the first time since 2014, San Francisco’s housing pipeline has dropped on a year-over-year basis and is now 400 below its peak in the third quarter of 2016, following the trend we first noted forming last year. Keep in mind that the seemingly nominal drop in the pipeline is compared to a year-over-year gain of 4,700 units at the same time last year. That being said, there are still 6,600 units of housing under construction across the city which should be ready for occupancy within the next year or two (including the remainder of Avalon’s 326-unit Dogpatch development at 800 Indiana Street), which is down from 7,100 under construction in the second quarter of the year. In addition, there are now 12,400 net-new units of housing for which building permits have either been issued, approved or requested, and 31,500 units in projects that have already been approved but not yet permitted (which includes the majority of the 10,500 units by Candlestick, 7,800 units on Treasure Island and 5,680 units at Parkmerced, projects which have overall timelines measured in decades, not years). And with proposals for another 12,900 units of housing now under review by the City’s Planning Department, which is down from 13,800 the quarter before and versus 16,600 at the same time last year, San Francisco’s Housing Pipeline totals 63,300, including 10,000 “affordable” units which are to be offered at below market rates, according to our accounting of Planning’s database as newly mapped above. The beginning of a slow but prolonged drop in the pipeline? Not accounted for in the numbers are the 930 or so units entitled but put up for sale rather than moving forward with construction. SF is expected to be the hardest hit or one of the hardest hit cities as a result of the new tax bill. Add in rumblings of a ballot effort to repeal Hawkins-Costa and talk of eliminating vacancy decontrol and the housing situation is dicey in SF going forward. Population growth may have peaked. The Bay Area significantly lags Seattle, Portland, Phoenix, the Texas cities and others in projected growth over the coming decades. Other cities have more robust job prospects and livability which, with the tax changes, will spur more companies to leave SF and the greater Bay Area. BTW, didn’t the Giant’s organization significantly delay Mission Rock? One silver lining is, if jobs and population are near their natural peak in SF, there may not be the need for all these new units. Every proposed, approved/entitled and under construction unit in San Francisco is accounted for above, including those in projects which have been put up for sale. And while the total number of entitled but not yet permitted units (31,500) has increased from 28,700 at the same time last year, it hasn’t really budged over the past three quarters. Dave- the tax bill won’t significantly effect SF RE prices. Negative impacts will be offset by wealthy people benefitting from the Corp and pass through breaks, and they are the ones investing in SF RE. I doubt 1506 will pass, and even if it does vacancy control is still pretty taboo. If 1506 passes it will surly kill new construction rentals though, which is good for existing landlords like me though. The tax bill is but one more factor to add to the potential problems real estate faces in SF and California. California is seeing its growth rate fall. To .7% most recently and heading south. Over the next decade it’s likely California will start to lose population. SF has likely hit its peak population and could well start to decline. Several BA counties lost population early this year. High net worth individuals will continue to exit the state as will companies. SF’s .7% growth rate compares to 3.1% for Seattle and 2% for Portland. Job growth is also more robust in those cities. It’s true wealthy individuals may continue to invest but not as much as other markets offer better profit potential long term and better ROI short term. The fundamentals are easy to see – more than in 2014 or 2015. Certainly from the perspective of a real estate investor. San Francisco has a stronger economy than any other city in America, maybe barring New York (Apple, Google, Facebook, Airbnb, Uber, Lyft—none of those companies are going anywhere). We will continue to have extremely high demand. If we don’t build, though, this high demand will jack up prices even more. I suspect that Dave’s call on “peak population” in SF will play out similarly to his 2014 call of peak housing prices in SF. 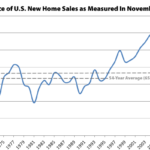 No one can call the peak in the real estate market or the stock market. I did not call 2014 the peak, I mentioned 2014 as the year that I exchanged my properties to out of state locations. Believing that appreciation would be better in certain other markets over the coming years. Texas cities and Phoenix have nighmarishly awful urban planning. They should not be pointed to as positive examples in that regard. I’m unclear on the legend: density is quantity per space, so this is units per….what… exactly (sq mile, acre, head of a pin)? Hopefully a temporary blip. 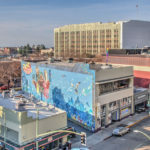 City departments are still implementing the executive orders of Mayor Lee to speed up permitting; changes to state law give builders more certainty that their zoning-compliant (including density bonus) projects will be approved; the likely passage of YIMBY’s ballot prop next June will speed up subsidized affordable housing, which is less affected by the market; and there are more and more rumblings of upzoning single-family areas, which could spur a lot of building by small property owners less subject to macro forces. All of these trends give me reassurance that we’ll continue making progress toward solving the housing shortage. I get tired of saying it so often, but I’ll say it again: Not building housing doesn’t make people go away. Not building housing doesn’t eliminate the need for infrastructure. In fact, the transportation infrastructure we need becomes cheaper and more efficient when we accommodate people with new housing in the city center, instead of letting them be pushed to the outskirts. So once these 63,000 units are built, what will be the City’s projected population? I presume the current population is around 871,000? Good question. Given the slowing population growth rate of SF, the Bay Area and California (.7%) and its downward trend it is possible in 10 or 15 years California and SF will be losing population. I’d guess 800K by the time these projects measured in decades are complete. It is possible all these proposed units will not be needed. This is such fantasyland nonsense. The only reason people are leaving is cost of housing… sometimes commutes/congestion as well but that’s a symptom of high cost of walkable housing around core transit stations. 63,000 units is only the very beginning of what we need. Quality of housing / neighborhood is an item in people leaving too. Public improvements are slowly getting built in SF – but they are offset in many places by having to deal with crazy homeless people and large piles of garbage on the door step. Petty crime – bike theft, car break-ins, mail/ deliveries disappearing has skyrocketed. SF is great if you live in a nicer neighborhood without any of the downsides – but many newcomers do not have that chance. They come for the $$$ – stay for a year or 2 – and move on elsewhere. Where are you pulling these long term projections from? Are you making them up? Provide links to the evidence. Google population growth and you can see the numbers. California/the Bay Area is growing at about .7% and that number has been falling. If the trend continues for the next 15 years it is possible California and the BA could start to lose population – note, I did not say it will happen. I said it could happen based on current trends. It’s happened to other states and metros. SF’s population growth is slowing because we’re not building enough housing. We have throttled supply. Keep in mind that there were roughly 5,000 units of housing delivered in 2016, the most in over two decades and twice the 10-year average of roughly 2,550 per year. True. It’s the most in two decades, but it’s so inadequate as to guarantee continued unaffordability. We should be adding at least 5k units every year. SF is running out of extra rooms, garages, and other spaces to squeeze in more people. If we don’t build, prices will skyrocket. The oft-repeated “5,000 units per year” claim is rather baseless, or rather based on a report which employs a specious model (at best). It’s the marginal unit of supply or demand that counts in driving real estate prices and rents. But you are correct in terms of the impact of affordability on growth. The lack of housing production in SF given job growth in recent years stands in stark contrast to Seattle. Seattle has not yet caught up with SF in population but, at 710K or so residents, the Gold Rush city has produced 32K units from 2010 through 2016. SF by comparison produced just 15K units. A tale of two cities was the featured article earlier this year in BizJournal showcasing the housing production disparity between the two cities. In 2016 Seattle produced over 6K units and is on track to produce at least 5K through 2025 – 5K/year. That is how, despite being the fastest growing US city at times these past few years, affordability – though getting worse – has remained much better in Seattle than in SF. SF’s housing production has gone above 3K units just in the last few years and should continue in the low 3Ks for two more years but will then likely fall off some. The housing/jobs imbalance will continue which is not healthy for SF’s future. That’s the whole point Dave, you don’t want too many units built if you’re an investor. You want limitations via nymbism, nutso socialist policies (like increasing the mandated affordable housing component, moratoriums, competition from non profits like MEDA, etc.) All stuff SF excels at, which is why real estate appreciates well here. Seattle is building too much new housing, and next downturn prices will plummet. In SF, not so much. Ya shoulda kept your gold over here mon! I still don’t know what’s baseless about my post. If SF had been creating 5000 more units of housing per year, we would have increased supply, and prices would be lower. Whats happening across the “border” at Brisbane and Daly City? Seems the bi-county links need to be improved, alongside some new-micro-density in those areas currently not seeing density. SF population has been growing by +- 10k per year over the last 5 years. While last year’s rise was 9k and this year’s increase might be around 7k, it is still far from a reversal. Or as we wrote above: “Keep in mind that the seemingly nominal drop in the pipeline is compared to a year-over-year gain of 4,700 units at the same time last year,” representing an effective swing of 7.7 percent and the first decline in three years. But strong work focusing on the tree. So the pace declined, but the pipeline leveled out. No. Having effectively grown since 2012, the pipeline just dropped on a year-over-year basis for the first time in three years. The pace started decreasing early last year, as we first reported at the time. I know this is slightly off topic, but does anyone know what happened to the Brisbane Baylands development? While technically not in SF, it is next to the city’s border and it bears 2-4k new units. It seems like they delayed it until some local election but I thought it was scheduled for this fall. What about Daly City redevelopment? they could use a light-rail connecting colma to top of the hill and back around to john daly blvd. maybe northbound to SFSU and Parkmerced? Some thing often not talked about is that the Tax Changes ENCOURAGE SMALLER AFFORDABLE HOMES! With the change in the Tax Laws there is now a strong reason for developers to build cost efficient smaller living spaces in the city that will result in a smaller tax hit and sticker price! I agree with SS. Records reveal the pipeline did drop for the first time in 36 months.